In 1899 construction of the Ferntree Gully-Gembrook Line began which included the Rail Bridge, over Monbulk Creek, Selby. Victoria Railways architects designed the line and The Board of Lands and Works Construction Branch employed one hundred and eighty men for a period of sixteen months, many of them local timber workers, as labour. 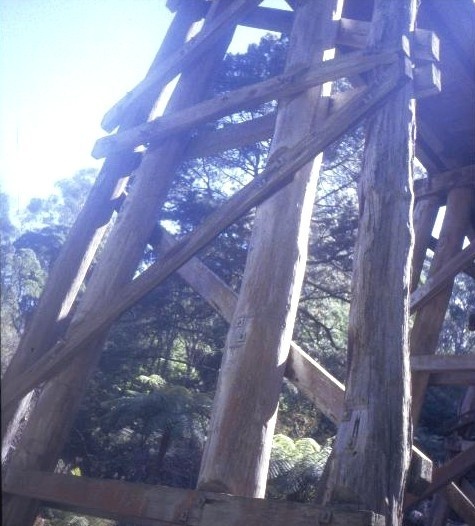 One of the features of the construction of the railway, and in particular the Trestle Bridge, was the use of construction methods which utilised native bush timbers. These were not in ready supply at this time as the area had been devastated by bushfire in 1898. The narrow gauge line supplied local people with goods and services on a regular basis and provided reliable access to markets for local industries as well as revitalising the tourist industry in the picturesque hills. In 1954 the narrow gauge line was closed and in 1958 management of the line was handed over to The Puffing Billy Preservation Society. The Puffing Billy steam train services began on the line in 1965 as a tourist concern. In 1977 the ownership of the line was handed over to the Tourist Railway Board. The Rail Bridge, over Monbulk Creek, Selby is a curved, timber trestle bridge carrying a single narrow gauge track which spans the Monbulk Creek and the Belgrave Emerald Rd. A viewing bay has been constructed for tourists, off Belgrave-Emerald Rd. The bridge is 85 metres long, 12 metres high at its highest point and comprises 14 spans of 6 metres, curved to a radius of 20 metres. The bridge has a tight 3 chain curvature. It was constructed from local, native bush timbers. The bridge has undergone progressive replacement of damaged timbers. Major structural repair and conservation works were carried out in 1983 and 1988. The Rail Bridge, over Monbulk Creek, Selby is of historical, social and architectural importance to the State of Victoria. The Rail Bridge, over Monbulk Creek is of historical importance for its association with the construction of narrow gauge railway lines in Victoria. During the 1890s depression, broad gauge railway line construction was not considered economically viable and the Parliamentary Standing Committee on Railways in 1896 considered alternative railway construction techniques. Following the committee's recommendations, four narrow gauge rail lines were built in Victoria between 1899 and 1916. The Rail Bridge is an important component of the former narrow gauge Ferntree Gully-Gembrook Line. The bridge is also of historical importance for its association with the economic stimulus the narrow gauge railway generated in the Dandenongs. Businesses that benefited included the Nobelius Nurseries, which became the largest nursery in the Southern Hemisphere in the pre World War One period. The timber, tourism and soft fruit industries also benefited from the lines' construction. The Rail Bridge, over Monbulk Creek is historically and socially important for its association with the recreational tourism industry in Victoria. The journey into the hills, including the ride over this famous bridge, became a popular weekend recreational activity enjoyed by local and overseas visitors from the lines' initial construction in 1899, and after its reopening as the Puffing Billy Line in 1965. The bridge is socially important for its associations with the community movement to protect and restore the narrow gauge line from the 1950s. This movement is an example of community concern over heritage issues which developed within parts of the Victorian community in the post war period. 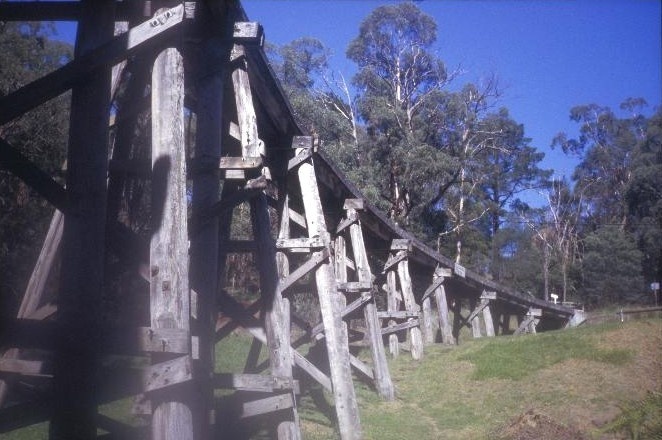 The Rail Bridge, over Monbulk Creek is architecturally important because it is an essentially intact example of a timber trestle bridge and is possibly the most extremely curved surviving bridge in Victoria. It is also significant as an example of trestle bridge construction, using construction methods which utilised local native timbers. Rail Bridge, Monbulk Creek, Belgrave-Selby Line, Selby, Yarra Ranges Shire Council. 1. To the extent of: All the structure marked B1, known as Rail Bridge, over Monbulk Creek including decking, superstructure, timber trestles and abutments as marked on diagram 602860 held by the Executive Director. The Railway Bridge over Monbulk Creek, Selby was constructed in 1899 on the narrow gauge Ferntree Gully - Gembrook Line, by the Board of land and Works. It consists of 14, 20’ spans supported on timber trestles on a tight curvature, carrying the historic Puffing Billy single narrow gauge railway line over Monbulk Creek and the Belgrave-Emerald Road . The Railway Trestle Bridge over Monbulk Creek near Selby is of significance as an important element on the historic ‘Puffing Billy’ narrow gauge railway line and in the surrounding landscape. It is a representative example of one of the four 2’ 6” lines to be constructed in Victoria, all in mountainous locations. 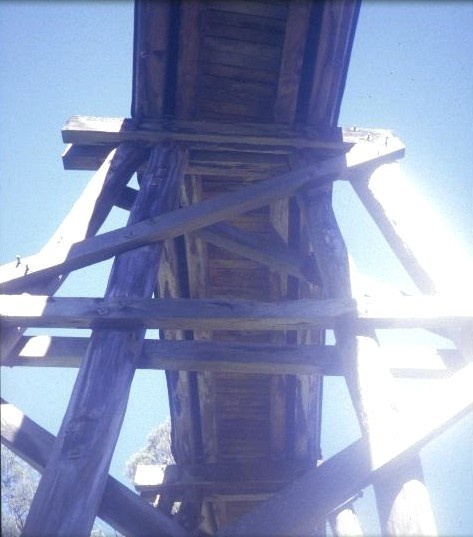 The railway structure is a rare and essentially intact example of a timber trestle railway bridge in Victoria. It is also significant as a notable example of timber trestle bridge construction. It demonstrates a distinctive and now rarely used construction method that utilised native bush timbers . The opening of the line was significant for its role in providing a stimulus for primary producers such as Carl Alex Nobelius, whose nursery became the largest in the southern hemisphere . 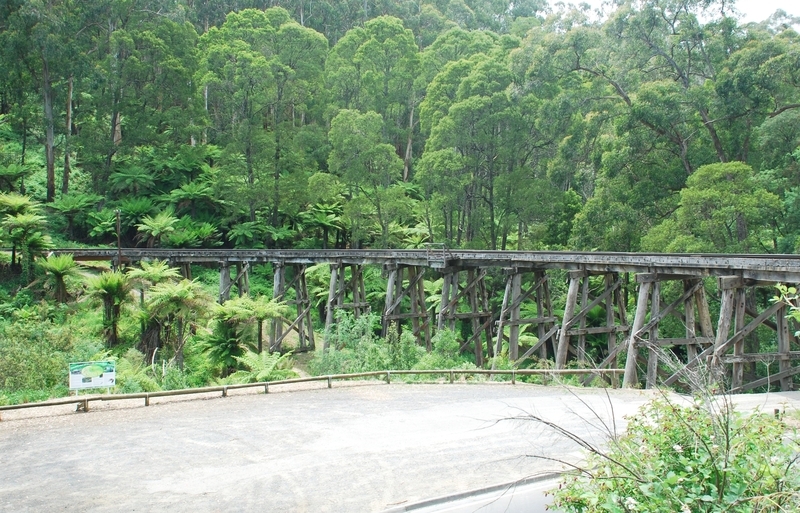 There are five other timber railway bridges listed on the Victorian Heritage Register. Two located at Pyalong (1889 and 1890), Timboon (1892), Nowa Nowa (1916) and Noojee (1919). The Selby Trestle Bridge is the only trestle bridge on a narrow gauge line which is still in regular use as part of a working steam rail line. 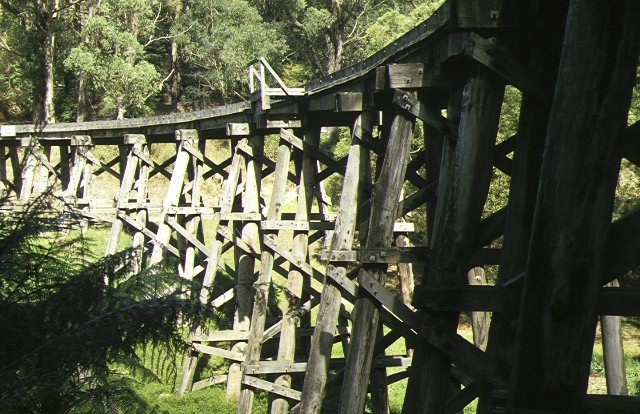 It is the most extremely curved timber trestle bridge surviving in Victoria.